The Southwest Through Wide Brown Eyes: Coal Bed Canyon, the Lower Section. ...it's also a paradise for ATVers. There is an ATV trail at mile mark: 10.3, 10.8, 11.2, 11.3, 11.6, 11.8, 12.8 (following the fence line), 13.2, 13.7, 14.7, 15.2, 15.3 and lets just say that this lower section of CR 341 has numerous ATV trails. Yep, we stopped marking them down after the twelfth one. A little description I found about Coal Bed Canyon, "COAL BED CANYON (San Juan County) originates near the small agricultural community of Northdale in Dolores County, Colorado. It drains southeast into Montezuma Canyon. Coal beds are exposed in the canyon", hence the name. Now as we drove along, we did see many piles of black colored stone and indeed wondered if this was the exposed coal. There were also many interesting groupings of huge boulders; this must be a geologist paradise out here! Table Top Summit is along this road, not to be confused with Table Top Mountain in Summit County; doing research can be stressful when two places, in the same state, are the same name. Table Top did not receive its official name until 1980 and is also known as "High Butte". At mile mark 17.8 we came to a split in the road and while both start out fine for a 4 wheel drive vehicle; well, you'll see what I mean. First we took the trail to the right, but were only able to go one mile before the trail became an ATV/Hiking only trail. For us to keep going forward would have meant breaking an axle on the potholes or huge rocks; definitely NOT on our to-do list. There was an interesting rock formation at this point though; sort of looks like a giant hand with fat fingers giving us a huge high five. At the time, we both did not know what kind of snake this was, but later on identified it as the Common Kingsnake; nonpoisonous, but they will strike if provoked. So what does Roy do, gets out of the vehicle, goes a little closer to it and says, "I think it's dead. ", to which I reply, "Well don't expect me to get out and poke it with a stick!!!" To be truthful though, I was a bit excited that I had finally seen a snake in the wild; I had no intention of playing with it, but seeing it was a huge thrill. By the way, see that little white dot on its head; nature's way of giving it a defense mechanism while it's sleeping by making it look as if it's awake. I still was NOT going to poke it with a stick!!! Back track to the main road and taking the trail to the left; we stopped a little way in so I could take this shot as the scene looked so pretty. What I found out later on was that in 1875, William Henry Jackson had taken a photo of the same area while part of the government geological survery team. 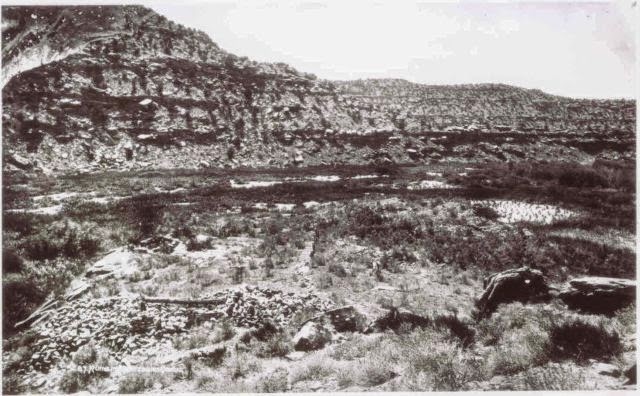 At that time there were Anasazi ruins visible in the area, but overgrowth and cattle have more than likely destroyed them. Original 1875 Photo by Willian Henry Jackson: Confluence of Coal Bed Creek and Montezuma Creek. Now this next photo is entitled, "Abandon All Hope, Ye Who Enter Here Without an ATV" and we should have foreseen that this was a warning of what may happen. It didn't happen to us, but very well could have. A mile down the trail seems to disappear, but no, it just takes a slight dip downward and then continues on past a cattle water tank. The trail is a bit rougher, but nothing we couldn't handle; the scenery was getting more and more spectacular. Then we finally saw it, could it truly be? Yes, Montezuma Canyon Road! I was going to be able to add another road to my series, "All Roads Lead to Montezuma Canyon Road", so continue on we did down a steep section of trail that was also partially blocked by, what appeared to be, a landslide. We made it around the boulders fine and stopped for a spectacular viewing of the canyon below us; so beautiful ! Looking downward, Roy estimated we were about 200 feet up; so close and the adrenaline was pumping high. Back into the SUV, around a corner and slam on the brakes for what we saw before us. A trail, but no trail that our vehicle would ever make it down; potholes, missing section of trail, huge stones. The only way down was hiking or on an ATV; the SUV would get stuck in a pothole, break an axle, or worse yet, tip over and roll down the 200 feet to the canyon floor below. I actually stood there and cried; we were so close, just within reach of Montezuma Canyon Road and now had to turn back. This was heartbreaking! The drive back was a mixture of sad and mad, but soon the scenery had our emotions soothed out again and plotting out our next adventure. There are many more roads to explore that may or may not lead to Montezuma Canyon Road, we're going to find out which.